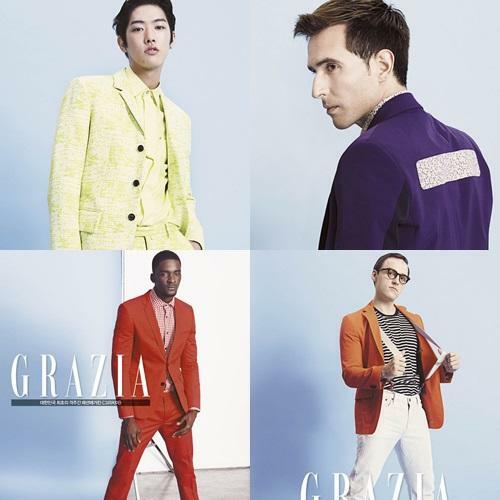 [by Nawael Khelil] The photoshoot and interview that Grazia Korea had with Guillaume Patry, Enes Kaya, Samuel Okyere and Terada Takuya from JTBC\'s \'The Nonsummit\' was revealed earlier. For the photoshoot, the four members of the funniest summit put on some nice suits and color-blocked outfits that emphasize their bright personalities. This meeting with Grazia was an opportunity for the guys to speak out what they really think of their life Korea, and is there a better topic than \'Korean Girls\' for that ? Following the mood, Guillaume praised them for being \"the most beautiful girls in the world\" while Enes talked about how \"indecisive they are while choosing something to eat\".